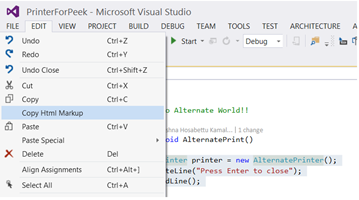 A set of extensions to Visual Studio 2015 Community (and above) which improves developer productivity. is an extension pack that brings powerful tools for improved developer productivity. 1. 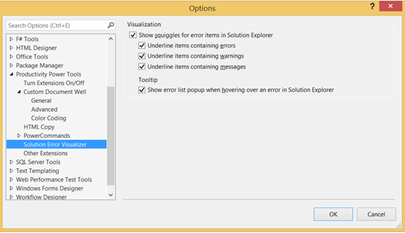 Solution Error Visualizer has been updated to take advantage of the new Visual Studio 2015 Error List and its advanced filtering capabilities; filters applied in the error list will now apply to the visualizer too. 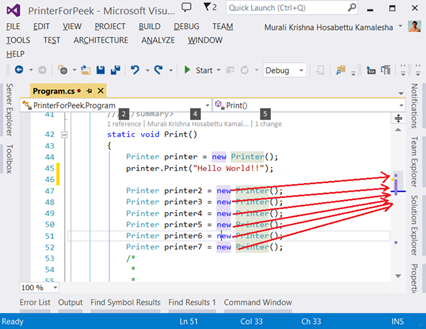 We have introduced a feature called Peek Help that can be invoked from the context menu or using the keyboard shortcutAlt+F1. This brings up the F1 Help content inline in the editor, below the symbol, using Peek. This is a full browser control, so you can do navigation, find and so forth. Note: Filtering the Error List by file scope (ie. Open Documents, Current Project, Current Document, etc) will not affect the display in the Solution Explorer. Clears the Visual Studio recent file list. The Clear Recent File List command brings up a dialog that allows any or all recent files to be selected. Clears the Visual Studio recent project list. 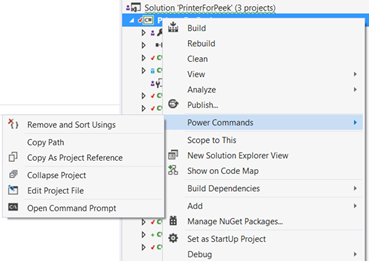 The Clear Recent Project List command brings up a dialog that allows any or all recent projects to be selected. Whenever a tab becomes active, it is moved to the left - such that all tabs will be sorted in most recently used order. 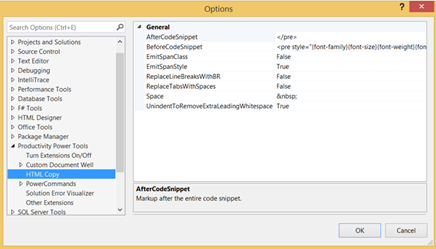 Provides support for the HTML Clipboard format when cutting for copying code from the editor. This means there is no need to fix up the formatting of code when pasting it into a TFS work item form or another HTML based control. It is possible to modify the html format that gets copied to the clipboard. 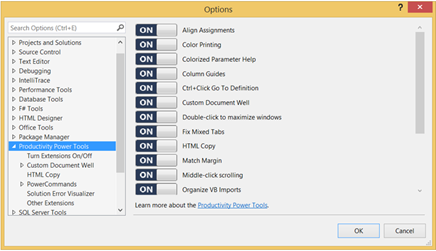 Users can customize the behavior in Tools > Options > Productivity Power Tools > HTML Copy. We added two new options when copying: ReplaceTabsWithSpaces andUnindentToRemoveExtraLeadingWhitespace, which detects a common whitespace prefix and trims it so that the copied code is aligned with left margin wherever you paste it. For example, with all lines indented 12 spaces, this option will detect a common whitespace prefix of 12 spaces and trim that.